Marc Jackson’s work is always welcome round these parts and when it’s this good that’s doubly so. 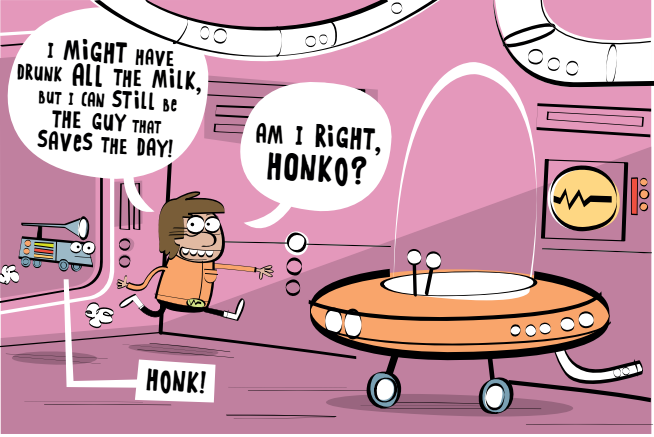 Goons of the Galaxy is Marc’s typical exuberance and carefully concealed laconic jokes all wrapped around, well, space. Jerry lives with his Uncle Larp. Jerry’s a human, Uncle Larp very VERY much isn’t. What Uncle Larp is? Is a fan of blue milk. What Jerry’s just drunk? Yeah. Kind of blue, SUPER milky. What follows is a trip to the shops that includes an epic space battle, a crash and the sort of skewed humour that would make Reeves and Mortimer applaud. Jerry’s like Star Lord with way more enthusiasm and just a stitch less competence and his heroic quest to get some blue milk is fraught with peril. And detours. And…Well, read it, it’s great. But not as great as the three page short story that follows it which may be the best thing Jackson’s done to date. Marc’s work is one of my favourite things in comics. It’s gentle and sweet and tries very hard to hide how clever it actually is behind how funny it always is. This is his best yet. And go see Marc at his site. Next Now live! The Pseudopod 10th Anniversary Kickstarter!